IP traffic will grow in a massive way as 10 billion new devices come online over the next five years. Those are just a couple of the amazing facts found in Cisco’s 11th annual Visual Networking Index look at all things in the communications world. “Advancements in the Internet of Things (IoT) are continuing to drive IP traffic and tangible growth in the market. Applications such as video surveillance, smart meters, digital health monitors and a host of other Machine-to-Machine services are creating new network requirements and incremental traffic increases. Globally, M2M connections are calculated to grow nearly three-fold from 4.9 billion in 2015 to 12.2 billion by 2020, representing nearly half (46%) of total connected devices,” Cisco stated. Smartphone traffic will exceed PC traffic by 2020. In 2015, PCs accounted for 53% of total IP traffic, but by 2020 PCs will account for only 29% of traffic. Smartphones will account for 30% of total IP traffic in 2020, up from 8% in 2015. PC-originated traffic will grow at a CAGR of 8%, while TVs, tablets, smartphones, and machine-to-machine (M2M) modules will have traffic growth rates of 17, 39, 58, and 44%, respectively. Traffic from wireless and mobile devices will account for two-thirds of total IP traffic by 2020. By 2020, wired devices will account for 34% of IP traffic, while Wi-Fi and mobile devices will account for 66% of IP traffic. In 2015, wired devices accounted for the majority of IP traffic at 52 percent. Annual global IP traffic will surpass the zettabyte (ZB; 1000 exabytes) threshold in 2016, and will reach 2.3 ZB by 2020. Global IP traffic will reach 1.1 ZB per year or 88.7 EB (one billion gigabytes [GB]) per month in 2016. By 2020, global IP traffic will reach 2.3 ZB per year, or 194 EB per month. Global IP traffic will increase nearly threefold over the next 5 years, and will have increased nearly 100-fold from 2005 to 2020. Overall, IP traffic will grow at a compound annual growth rate (CAGR) of 22 percent from 2015 to 2020. Global Internet traffic in 2020 will be equivalent to 95 times the volume of the entire global Internet in 2005. Globally, Internet traffic will reach 21 GB per capita by 2020, up from 7 GB per capita in 2015. The number of devices connected to IP networks will be three times as high as the global population in 2020. 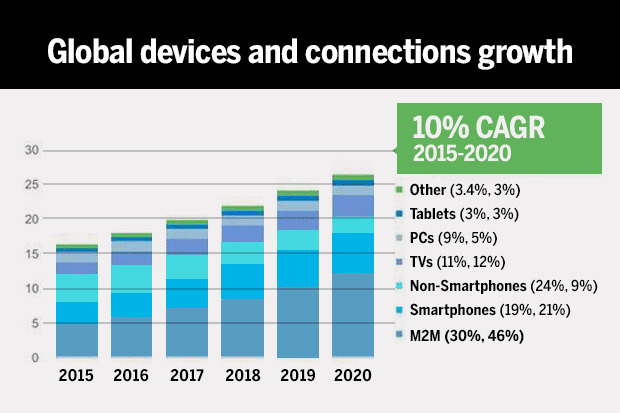 There will be 3.4 networked devices per capita by 2020, up from 2.2 networked devices per capita in 2015. Accelerated in part by the increase in devices and the capabilities of those devices, IP traffic per capita will reach 25 GB per capita by 2020, up from 10 GB per capita in 2015. Broadband speeds will nearly double by 2020. By 2020, global fixed broadband speeds will reach 47.7 Mbps, up from 24.7 Mbps in 2015. Globally, IP video traffic will be 82% of all consumer Internet traffic by 2020, up from 70% in 2015. Global IP video traffic will grow threefold from 2015 to 2020, a CAGR of 26%. Internet video traffic will grow fourfold from 2015 to 2020, a CAGR of 31%. Internet video surveillance traffic nearly doubled in 2015, from 272 petabytes (PB) per month at the end of 2014 to 516 PB per month in 2015. Internet video surveillance traffic will increase tenfold between 2015 and 2020. Globally, 3.9% of all Internet video traffic will be due to video surveillance in 2020, up from 1.5% in 2015. IP traffic in North America will reach 59.1 EB per month by 2020, at a CAGR of 19 percent. Monthly Internet traffic in North America will generate 11 billion DVDs’ worth of traffic, or 44.7 EB per month. Business Internet traffic will grow at a faster pace than IP WAN. IP WAN will grow at a CAGR of 6% , compared with a CAGR of 21 percent for fixed business Internet and 47% for mobile business Internet. Cisco says its Visual Networking Index Forecast methodology was developed with a combination of a myriad analyst projections, in-house estimates and forecasts, and direct data collection.